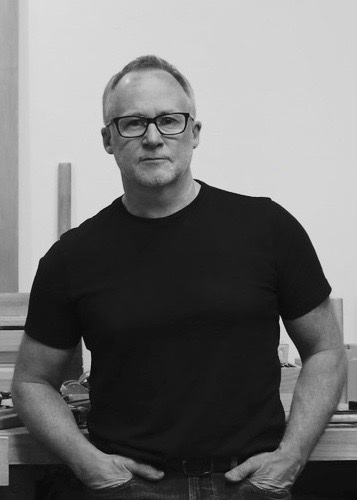 Considered by many as one of Vancouver’s most gifted furniture designer/makers, Nicholas’ dedication to his craft is evidenced in the high level of craftsmanship, exacting joinery and careful attention to detail that is given to each piece he creates. Though he has worked in many different styles for clients over the years he is most drawn to a contemporary aesthetic and is currently experimenting with new materials and techniques and pushing himself to explore more organic forms in his exhibition work. Nicholas was originally trained in graphic design which has informed his work for many years and proved invaluable during his studies in fine woodworking. He spent a short time at the University of the Arts in Philadelphia and then trained in the UK under renowned master furniture maker David Charlesworth. Though born in the UK Nick spent most of his life in Canada & the U.S. In 2000 Nick established his studio on Bowen Island, BC and has been in East Vancouver since 2010. The main focus of Nicholas’ work is bespoke furniture for discerning clients and a very special collection of inspired designs available through select showrooms, galleries and exhibitions. With a belief in the intrinsic value of good design and the handmade object, Nick is always up for a conversation about design, originality or the latest trends and aims to be a leading influence in the local design community. If you would like to discuss commissioning a piece please see the ‘Bespoke’ page for more details.